Product Information｜Corporate Information｜NISSEI PLASTIC INDUSTRIAL CO., LTD.
NISSEI PLASTIC INDUSTRIAL CO., LTD. has been promoting productions in harmony with nature and will release an injection molding system "N-PLAjet" for the US market. It processes a newly developed plant-based PLA (polylactic acid) material, which was created to reduce the environmental impact. In October of last year, NISSEI officials visited SPI (The Society of Plastic Industry, Inc., headquartered in Washington DC) and met the CEO Mr. William R. Carteaux. In the meeting, NISSEI disclosed that they had been developing molding systems for plant-based resins, suggested to establish Machinery & Tool's subcommittee within SPI, and showed their enthusiasm for bioplastics. NISSEI has been focusing on developing and building the bioplastics molding systems, having the related technology patented, and receiving orders for the Japanese market since April. NISSEI is ready to begin sales in the US market from this October to meet expanding demand for bioplastics, a trend driven by increasing global environmental concerns. Environment-friendly material PLA is plant-based and biodegradable. It is attracting wide-spread attention as a substitute material for petroleum-based plastics. However, there are some issues to be solved, such as its poor heat and shock resistances. Reinforcing those properties can make thin-wall or deep-well moldings difficult since the fluidity and mold releasability will be sacrificed. As a current trend, polymer alloys of PLA and petroleum-based plastic are used for injection molding, and majority of 100% PLA materials are used for film/sheet for packaging and cards. In order to disseminate and explore further possibilities of its use for PLA material, NISSEI has been teaming up with Komatsu & Associates (President: Michio Komatsu), which is the consulting firm for mold and molding process technologies. By utilizing NISSEI's injection molding machines (electric & hybrid types)/mold processing technology and Komatsu & Associates' PLA molding related patents, inventions, and expertise in its related technologies, PLA injection molding system "N-PLAjet" was born, materializing deep-well molding of heat-tolerant PLA as their first collaborative creation. For basic patent, Japanese patent No.4511959 is granted in May, and they are currently applying for patents in the US and other major countries. The tolerable temperature for general-purpose (non heat-tolerant) PLA molded product is up to 60°C, and its use has been limited due to this poor heat tolerance. Heat-tolerant PLA can endure up to 120°C temperature; however, the molding of heat-tolerant PLA is difficult due to its poor mold releasability, and it has hardly ever been considered for commercial use. 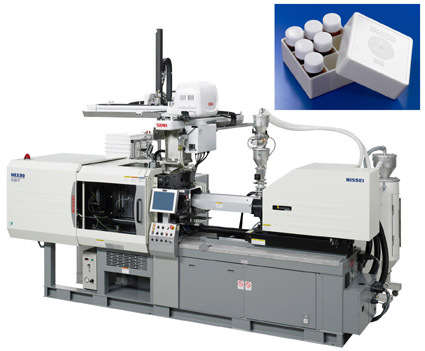 In order to materialize mass production of heat-tolerant deep-well molded products, NISSEI utilizes a method to facilitate mold release while ensuring the heat-tolerance (120°C). It also achieves shorter cycle time by optimizing the cooling time. NISSEI offers a total of 19 PLA specification injection molding machines from their electric type "NEX Series (16.5~507 US ton)" and hybrid type "FNX Series (89~501 US ton)." In addition, these PLA specification machines are equipped with mold temperature controller, mold inner pressure/temperature direct control system, air blow system, and valve gate (hot runner mold) capable interface, offering wide selections of injection molding machines and expertise in mold technology according to purpose. This "N-PLAjet System" includes a special molding machine, peripherals, and production license and its know-how for the special mold. It is currently targeting the markets for disposable and returnable products, such as food container, medical, cosmetic, sundry, and stationary industries. NISSEI will be exhibiting and revealing the PLA specification electric injection molding machine "NEX80-12E (88 US ton)" at "PLASTEC MIDWEST," which will be held from September 28th to 30th in Chicago, IL. As an example of molding heat-tolerant deep-well container, family molding of vial holder (body and lid) using heat-tolerant PLA material (nanocomposite PLA) will be demonstrated at the expo. Vials are transparent containers used for storing chemicals. A holder that hold 9 vials and lid (dissimilar shaped and volume molded product) will be molded together by the electromagnetic control valve gate. It is also equipped with the system that detects resin temperature and pressure inside the mold with ultra precision and directly controls mold condition adjustment and mold movements.